In March 2018, the Libertas Clinical Case Manager was honored for her outstanding work by the Queensboro Council for Social Welfare. Congrats, Liz! In March 2018, the Libertas Medical Director gave the keynote address at an Elmhurst Hospital Women’s History Month event titled “Honoring Women Who Fight All Forms of Discrimination.” The presentation focused on the work of the Libertas Center and other health care disparity challenges and was attended by over 150 doctors, social workers, and other health care professionals. A 2nd year Mt. 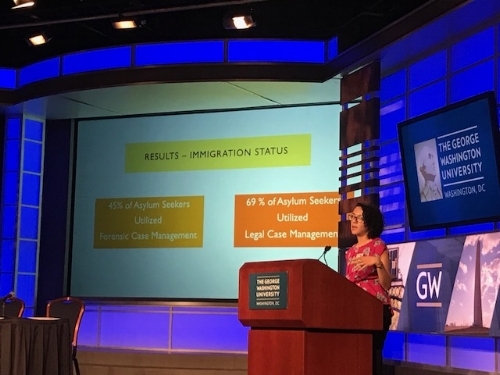 Sinai medical student who interned with Libertas during the summer of 2017 presented the findings of our Social/Legal service utilization study at the National Consortium of Torture Treatment Programs (NCTTP) Annual Research Symposium in March 2018, in Washington, DC. Medical Director, Dr. Dinali Fernando, and Program Director, Matthew Kennis, participated in post show discussion panels following performances of Houses on the Moon Theater Company’s play called De Novo. De Novo tells the true story of Edgar Chocoy, a teenage boy from Guatemala who faced deportation after fleeing to the U.S. in order to escape the MS-13 gang.